China has become increasingly irritated by a US administration that keeps changing its mind on tariffs. Results from previous negotiations have been taken off the table until the US cancels it’s planned tariffs on China. Media reports suggest that the US could announce its tariff plan by mid-June. 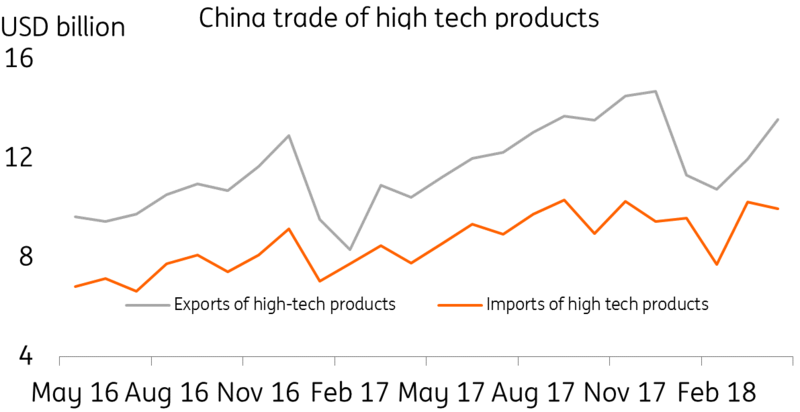 If the US follows through with its plan to announce sanctions on high-tech Chinese goods and related businesses before the end of June, it's also likely that China will take a similar approach to US businesses operating in China. Clearly then, June looks set to be a tense, rollercoaster month for China-US trade and investment. Meanwhile, China has made repeated statements that it plans to further open up its markets to the rest of the world – especially for consumer goods, clean energy and high-tech products. But if the US imposes tariffs on Chinese goods, China will do the same for US goods. That implies that the opening up of the Chinese market would benefit every other economy, except the US. Take China's tariff cut on automobiles as an example. The policy benefits all automobile manufacturers from European brands to Japanese and Korean producers. However, US manufacturers won't gain unless the US lifts tariffs on Chinese imports of steel and aluminium. Of course, tariffs on automobiles may not hurt the US to a great extent given that it doesn't export cars in large numbers. But if the opening up of markets includes agricultural products and energy- and if the US insists on imposing tariffs on Chinese goods- US companies would be worse off from the tariff cuts by China on these goods. The opportunities brought about by China’s liberalisation would most likely be felt by so-called ‘Belt and Road’ countries in relation to energy, and by Europe/Asia for agricultural products. These countries can enter into the Chinese market without facing competition from US companies. Empty trade talks would effectively mean the US is shutting itself out of the business, while at the same time, the rest of the world would have stronger trade ties with China. As we pointed out in previous notes, the US isn't just targeting a narrowing in the bilateral trade deficit. It also feels that its status as the world's biggest and most high-tech economy in the world is under threat from China's "Made in China 2025" plan. We believe that the US is working hard to delay China's economic advancement, especially in sectors related to the high-tech industry. Therefore the chances of the US allowing more exports of technological-related goods and services to China is fairly low, even if this would help lower the trade deficit. In this case, we think China would put more effort into achieving its self-sustained high-tech target by investing more in targeted industries. The biggest tech companies in China echo Xi Jinping's aim to be self-sustained in high-tech sectors. We expect that investment in these sectors will be one of the key drivers of future Chinese growth. Our forecast of 6.8% GDP growth still holds, on the basis that this investment will offset the loss of activity from deleveraging reform and any loss of trade. For 2Q18, we also keep our forecast for 6.8% YoY GDP growth, helped by decent consumption and investment, as indicated by good PMI numbers and industrial profits. We have also revised our yuan forecast due to the stronger dollar created by recent trade tensions and uncertainty in Europe.